The "Dear Boss" letter was received by the Central News Agency in London on Thursday, September 27th, 1888; it was forwarded to Scotland Yard two days later. It was written in red and contained many macabre details that could not be ignored. It was signed "Jack the Ripper"
Whitechapel's terror now had a name, a name that would haunt the London district forever. Dear Boss is the first expansion for the board game Letters from Whitechapel; it plunges you into the filthy atmosphere of the Whitechapel district. You will better know the main characters of that frightening fall, and you will face new and intriguing challenges, both as Jack and as detectives. 25 Jack Suspect cards that depict those suspected of committing the crimes. 5 Policeman cards that feature new abilities for the Police. 12 Potential Victim cards that give details about the murdered women. New and improved Jack's screen includes new game rules. 12 fantastic miniatures for more exciting games. 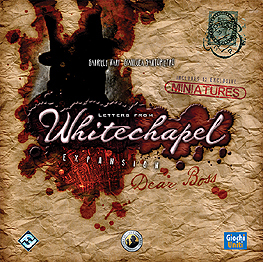 Letters from Whitechapel is required to use this expansion.